The J.N. Ding Darling National Wildlife Refuge is part of the National Wildlife Refuge Systems, located on Sanibel Island, Florida. The mangrove ecosystem is the largest undeveloped system in the US and is popularly recognized for its vast population of migratory birds. Named after Jay “Ding” Norwood Darling, who was a lead figure in the blocking of the sale of Sanibel Island lands that were environmentally fragile to developers, Sanibel National Wildlife Refuge, renamed as J.N. Ding Darling National Wildlife Refuge in 1967, was signed into Executive Order by President Truman in 1945. The refuge spreads over 6,400 acres of submerged seagrass beds, mangrove forests, marshes, and hammocks with nearly 3,000 acres being designated as a Federal Wilderness Area by the United States Congress. 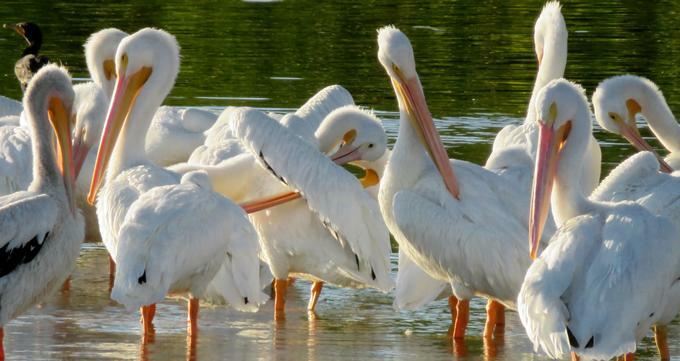 There are many endangered and threatened species that are protected in the refuge on Sanibel Island that provides a feeding and nesting ground for these animals including more than 245 species of birds. There are many ways to enjoy the J.N. Ding Darling National Wildlife Refuge with both indoor and outdoor activities for individuals and families. When visiting the refuge, make sure to wear sunscreen, hats, and bug spray and stay hydrated. Wearing athletic shoes that are comfortable and suited for walking is highly recommended. The speed limits are also strictly enforced by conservation officers for the safety of all visitors and wildlife. Dogs are permitted on Wildlife Drive, Indigo trail and Bailey Tract so long as they are on leash. More rules and regulations can be found by visiting the refuge website. Visitors Center- The Visitor & Education Center is free and open daily with extended hours in the spring. The center is handicap accessible with nature exhibits, a gift shop, interactive and educational programs, volunteers available for questions, and restroom facilities. Hours and holidays closures are detailed on the website. Wildlife Drive- The drive is open daily except for Fridays and is accessible all year, even on holidays. There is a per vehicle admission fee. Hours and pricing is available online. Visitors can drive, hike, or bike with their dogs on 4 miles of paved road. There are also 3 trails that are accessible from this drive with common wildlife sighting of alligators, rabbits, otters, bobcats, and water birds. Water Sports- Kayaking, canoeing, paddle boarding, fishing, and boating are all very popular at the refuge. There are two designated launch sites for those wishing to kayak and canoe and there are guided kayak, canoe and stand up paddle board tours offered by Tarpon Bay Explorers that take patrons deep into the refuge and Captiva Island. Those who wish to enjoy salt water fishing will find an abundance of snook, redfish and sea trout. Boating is only allowed in designated areas and all Florida state fishing laws are applicable. The Refuge has restrictions on motors and trolling with brochures on zone specific restrictions and maps available at the refuge. Hiking-There are 4 trails that the refuge suitable for hiking—Indigo trail, the Wildlife Education Boardwalk, Shellmound trail, and Wulfert Keys Trail. All of 4 trails are accessed through wildlife drive. Indigo trail is the shortest and located at the visitor’s center ramp. The boardwalk features a two-story observation deck with water views and educational displays. The Bailey Tract- This wetland tract off Tarpon Bay Road is a 100-acre parcel that features fresh water and unique wildlife found nowhere else in the Gulf refuge. There are additional hiking and biking trails found in this tract that is free to the public and open during daylight hours. Bird Watching- Bird watching and nature photography are a popular outdoor activity at the refuge. With over 245 species living in the expansive mangrove ecosystem and an impressive population of migratory birds that have the island as part of its path, The National Wildlife Refuge is able to track weekly bird observations through volunteers using eBird. The J.N. Ding Darling National Wildlife Refuge is a participant in the Junior Duck Stamp Conservation and Design Program for students in Homeschool and nontraditional educational programs such as nature centers and youth groups that cater to grades k-12. This program uses a science based-art curriculum to engage students in hands-on learning where they discover North American waterfowl and principles of conservation and the surrounding natural habitats. There are four different curriculum guides available to educators in science, art, math and technology. Each program has indoor and outdoor activities and the opportunity for students to enter the Junior Duck Stamp art and conservation contests.